Clearing your iPhone’s cache is easy maintenance that you should make a regular priority, as a cluttered cache could be the reason your iPhone is slow. You can clear up space on your iPhone’s cache by manually deleting information from your individual apps and browser, or by deleting and reloading apps to automatically clear the cache. Here’s an easy step-by-step process to clear your cache from Safari and third-party apps. Ever wonder why your iPhone’s loading speed is slower than usual? Contrary to what you might think, it isn’t necessarily because your phone is getting old or because your network is slow. It could be that your iPhone is bogged down by too many useless files and app data, which likely means it’s time for you to clear out your cache. Cached data encompasses all the files and images that your phone has hidden away in its memory. That includes passwords and scripts from previously-visited websites that your phone keeps handy for easy access. In theory, the feature is supposed to make things easier and faster for you, because your phone doesn’t have to repeatedly ask you for your passwords and other information. While Apple hasn’t confirmed it directly, the general consensus of the tech community is that when your iPhone gets backed up with too much data, your phone’s cache can make the device run at slower speeds. Clearing your cache can be a healthy habit to adopt to keep your phone operating at full capacity. Lucky for you, it’s a quick and easy process that even those who aren’t exactly iPhone savvy can do themselves. So, if you feel your iPhone is in dire need of a spring cleaning, then follow these simple steps, starting with the app you probably use the most, Safari. Before you go deleting data, make sure you know your essential passwords. This process will log you out of the websites you frequent. Past the toggles, you’ll see „Clear History and Website Data.“ Click that. 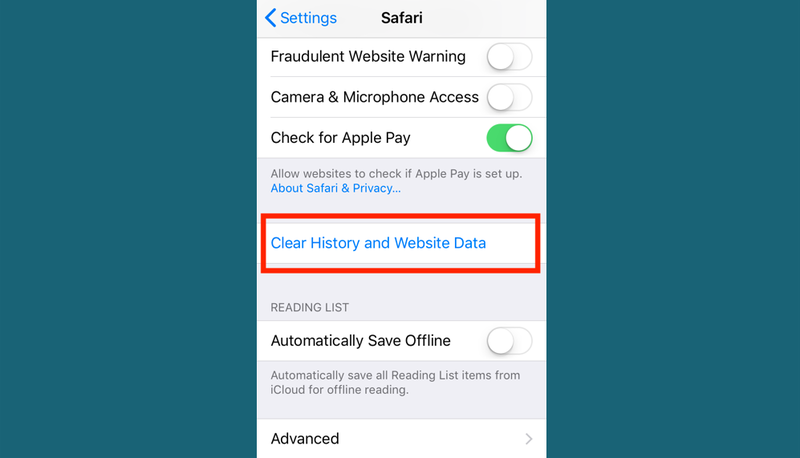 Your device will double check that you want to clear Safari’s data, so click through the message that follows. 2. 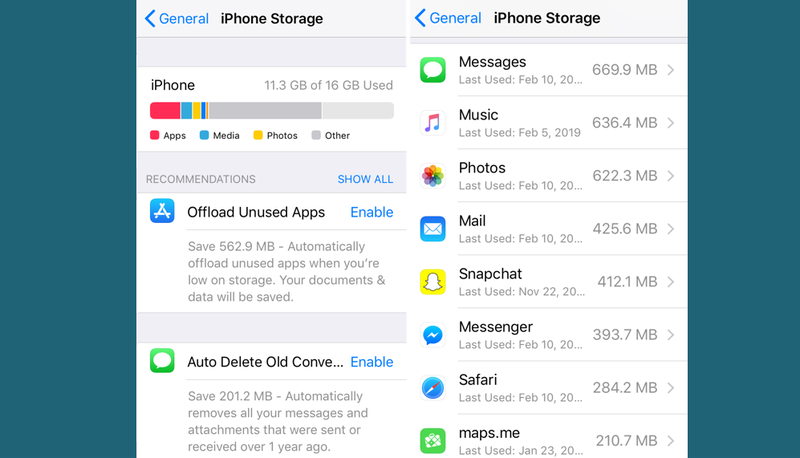 In „iPhone Storage,“ you’ll find a list of your apps, with the ones holding the most data at the top. 3. If you tap any of these apps, you can see exactly how much space its „Documents & Data“ is taking up. 4. If your device is getting full, it will offer you recommendations for what to clean up on the „iPhone Storage“ page. Just tap the „Show All“ button next to „Recommendations“ to read the descriptions for each. 6. If you’d like to clear out space manually, rather, then go into the app and start clearing out unnecessary files, such as old text conversations, playlists, photo albums, emails, and the like. If you have one app that’s taking up a tremendous amount of space unnecessarily, then it could be worth deleting the app and redownloading it, according to PCWorld. That’s because your social apps are storing away not just passwords, but images and videos that you’ve already watched, and sometimes the only way to clear that cache is just to erase it and clear out a significant portion of its cached data. To delete an app, just tap said app under the „iPhone Storage“ menu and then hit „Delete App“ at the bottom of the page. Redownload it by going into the Apple Store and searching for it or finding it in your „My Purchases“ list. If it’s a paid app, you will not have to purchase it again.